Wisdom of Life. 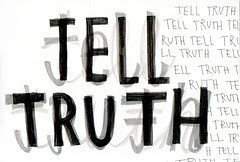 : Always tell the truth. Don't guess if you aren't sure! This was what I told my secretary, Fizah who has been working with me for sixteen good years. I called her to enquire some clients information at the office. Perhaps she was busy when she took my call, without the slightest thought she responded me with an answer. Though she is capable with her job with me, but being a working man for forty years experiences, I could also sense her uncertainty. As my clients expect high degree of expectation from my career, I have to be a perfectionist on my work. Every request and question has to be correct and prompt. Otherwise clients might not be satisfied with me. Of course I have to depend on my supportive staffs and especially my secretary who is always be in my office. Therefore all questions I forward to them, have to be positive and reliable. Meaning.. her replies have to be honest and straight forward without doubts. If she hasn't got the answer, say "no"! Or if she is not certain, don't be afraid to say "not sure". The "no" or "not sure" are still an answer. By not saying them and instead offering a "yes" might cause further consequences which might lead to more unpleasantness later. These three responses, "Yes, No or Unsure" can cause a lot of misery if they are meant not to be spoken. If you are unsure of a partner, please don't say "yes! I love you" or similarly if your heart has no sincere feeling for a soul mate, don't say "yes! I miss and need you". By twisting the no and unsure to a yes is actually cheating the other person. They can cause more harm than good. When I say..."Yes! Little darling I love you"...I meant every word of it. The end result is fantastic and delighting. In work or love, the three responses should be honest and frank.